It was the 31st of May and time to leave New Brunswick. I have a feeling though, that we might just come back for another visit to this wonderful province. 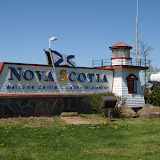 We came across the border into Nova Scotia on the Trans Canada Highway. We decided to take Route number 6 "The Sunrise Trail" along the Northumberland Strait to see the rural coastal villages. Nova Scotia here we come. Wonderful drive along the ocean. We stopped for lunch at Mc Mahon's Restaurant in Wallace for lunch. It is right on the water and a wonderful place for food. I had seafood chowder and a lobster roll. Liz had a lobster burger, all just wonderful. Mc Mahon's Restaurant in Wallace, NS. After a divine lunch, feeling a bit thursty, it seemed appropriate to stop in at Jost Winery in Malagash, just off Route 6, also along the Northumberland Strait. This winery has been producing wines for over 28 years. They make white, red, fruit, and specialty wines. Very different from what we are used to in British Columbia. Enough parking space for our chuck-wagon and pony. This winery is well worth the visit. They also have a restaurant and according to Liz "a gift shop to die for". We drove on and came to Seafoam. We decided to camp there for the night at Seafoam Campground. Keep me warm darling.... it's cold. The campground is OK with very nice views but some of the sites do slope quite a bit. Vegetable stir fry.... sooo good. We went for a walk on the beach, cooked supper and relaxed for the evening. Next morning the 1st of June, we were on the road bright and early. Before long we drove across the causeway over to Cape Breton. I have been in Cape Breton once before and it is so beautiful. There is so much wilderness and rolling hills. Our next stop was the Alexander Graham Bell National Historic Park in the town of Baddeck. This is a must see, don't miss it. If you have an annual pass to Canada's National Parks, then all the National Historic Sites are free. Each time you visit a National Site, not just the parks, it is free. A saving each time $ 5.00 to $ 10.00 each, the family yearly pass is about $ 138.00. Then you just show the pass each time. The park commemorates the humanitarian and scientific achievements of Alexander Graham Bell. You may only think the "telephone" when someone says Alexander Graham Bell.... not so. This man was in to just about everything, a real genius. Bell was a teacher, scientist and inventor. Not only did he invent the telephone, he also produced important inventions and discoveries in medicine, aeronautics, marine engineering, genetics, electrical science and laid the foundation for teaching deaf people to communicate. From studies on sheep to building hydrofoil speed boats to airplanes, he pretty well did it all. It was time to find a campground. We drove to Cabot Trail KOA Campground right on the water. Great spot to camp with full services. We are camped and the BBQ is on. The fog is moving in. Settled in for the night in our chuck-wagon. This is a really great spot. You get a little bit of noise from the highway but nothing to worry about. We will stay here again when returning from Newfoundland. More pictures on our Picasa Web-album. Just click the image below. Absolutely delightfull to travel with you. Lobster, steaks on the Barbie, chowder and more! How will you ever choose your favourite thing from each category: food, campsite, scenery, historic interest, ribbon of highway, restaurant, view and general welcome? I'm awaiting a #1 in all these areas!! !